Glory Britannia slot may have been slightly mis-titled here as the game is very much themed on medieval England before there was a 'Britannia' but nevermind as there's plenty of jousting and japes going on here. The appearance is similar to that of IGT's Medieval Money with shades of the humour in Ash Gaming's Monty Python And The Holy Grail and as one would expect we get some gentle lute music from the period as we play. We see a pleasant countryside backdrop to the reels which are placed over the obligatory castle, but will our bankroll get seized forever by these knights of the realm? 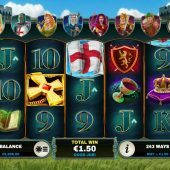 Glory Britannia slot is played with 243-ways to win so no pay lines as such here on our 5 reels and 3 rows, for which we pay 30 coins to spin - well, that's unless you want to hire the characters out to reap the benefits of their respective features. Before we get to the characters the basic 5-of-a-kind symbols appearing on the reels pay 500 coins for the Shield, 250 for Crown or Goblet, 100 for Ring or Book with six card values paying either 75, 50 or 20 coins for a full way. There are Gold Wilds on the centre 3 reels and like the other icons they all appear singly. The scatters are the Cross of St. George but before we get the 3 or more necessary for our bonus here, we must assess the benevolence of the 7 characters which are lined up above the reels! Right, in order to get the possibility of the 7 random features we must pay 10 coins extra for each one, so there is a 'shop' where you activate them. If you choose all 7 your stake is thus raised to 100 coins per spin, but you can choose none or any amount or combination you like. 1. Shades of Microgaming's Avalon here as we get Lady of The Lake who will randomly award 3 respins with all card values removed. 2. Templar Knight randomly awards a single respin with mystery treasure chest stacks which reveal the same icon. 3. Guinevere randomly awards one respin with an enchanted symbol that spreads. 4. Merlin randomly awards a a respin with 1 to 3 reels Wild. 5. Duke of York may randomly appear only during free spins to ward a multiplier of up to 5x on your winnings. 6. King Arthur may appear only on the spin that triggers free games - if he does he may give you up to 20 extra. 7. Robin Hood randomly appears also only during free games to add extra Wilds to the grid. If you land 3 or more St. George Flags then 15 free games are awarded. You cannot retrigger them but we do get an extra row in play to increase the game to 1024-ways for the duration. 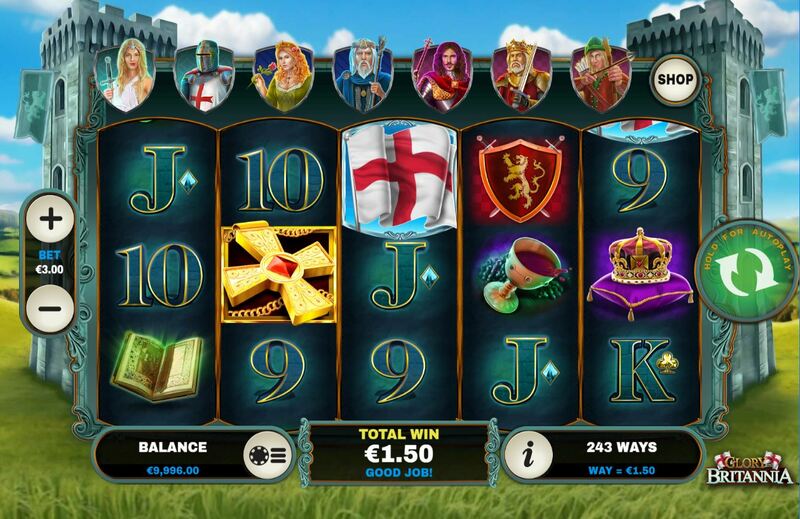 Of the above 7 enhancements, only Lady of The Lake and Templar Knight cannot appear during them and if you were lucky and King Arthur had appeared on the trigger you may have even started with up to 35 spins!